Embracing Slow Running | Eat. Blog. Run. These days I usually run four short runs each week. I push Vi to day care in her jogger to warm up and run the 1.2 miles home. The week before Christmas I decided to try to run a 5K since I knew I had my Winter Dash 5K coming up. I thought to myself: Just take it slow and easy; you haven’t run more than 1.2 miles at a time in a long time! So I headed out slow and easy. It felt fantastic. I got to the halfway mark and was thrilled that I felt so good and turned around to head back at my slow and easy pace. And then up ahead I saw an old dude slowly trotting along. Something primordial kicked in and all of a sudden, I immediately thought: I gotta pick that dude off! So I picked up my pace. By the time I caught up with him, I felt like utter crap. But now I had to keep up the pace so I could pass and put some distance between us (otherwise, AWKWARD!). I did so, and then not too long after that, I had to stop because I was so exhausted. And I was kicking myself for killing what was otherwise a lovely run. Also, my knees hurt. On Christmas eve day, I headed out with the intention of trying to do the 5K again. And I was determined to just tune everyone else out. I headed out at my slow and easy pace. It was a beautiful and quiet day. I felt fantastic and headed out one route where my option was to turn around and go back the way I came or do a longer loop. I ended up doing the longer loop and running 4+ miles. I honestly cannot remember the last time I ran 4+ miles! I was elated when I got home and realized that if I don’t worry about what other people are doing or obsess about being speedier, I can run a greater distance, enjoy the scenery, be quiet with my thoughts, and not get injured. This new perspective even led me to publicly share as one of my 8 intentions the desire to run a 10K and possibly a half marathon this year. Also, here’s the crazy thing. When I ran my Winter Dash 5K, I was able to maintain my slow and easy perspective, even as lots of people picked me off. It felt great (and it was also lovely that my husband Jon ran with me for the first time ever and stayed with my slow pace for the first couple of miles so we could chat). And then I got an email from the race coordinators, listing my time of 34:09 (10:59/minute). This may seem like total tortoise pace in some people’s books, but is pretty damned good in mine. I’m happy being the tortoise. Especially if it means I can avoid injury! Hi, my name is Katie, and I’m a slow runner. My current 5K time is 32-33 mins, if I can manage it with no walking breaks. That’s an improvement of a whole 3 mins from when I first started running almost 3 years ago. And I’m totally good with that and don’t see the need to go faster. If I’m getting a good cardio workout and burning the calories I need to, then speed is totally irrelevant. I’m doing my first half in April, and will be absolutely thrilled if I can average a 12:00 min/mile. Maybe I’ll see you at the Tufts 10K this fall! As a recent Facebook meme said, “6 minutes or 16 minutes, a mile is still a mile”. Ha, that’s lightning fast compared to me. But then again, I’ve been training for a half by running intervals and not really going for speed at all. 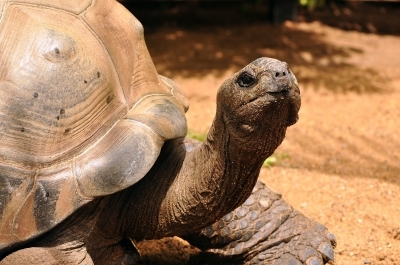 I wrote about being a Turtle recently too…embrace the slow! OMG Sarah, that is too funny. TURTLES UNITE!!!! Katie, great work! I’m trying to find a spring 10K and will keep you posted. I’m not only slow, I WALK. But, when I did a HOT 5k last May with walk breaks, I finished it in 32:48 which was faster than the previous year when I just ran the whole time. So I’m a bit believer in taking short walk breaks to catch my breath—it keeps from ever feeling that “sick” feeling of overdoing it. And, I’m so glad you are running more too! Hope to run a race with you! Wait, Christina, you did a 5K under 33 minutes including WALKING? Must be those long legs! And yes, want to run with you again too! Here are two spring 10Ks in my neck of the woods. Groton Road Race (http://www.grotonroadrace.com/). This is great for families and they start with super short races for the kids. Lots of fun! Just some ideas. Though you may be looking for something a little closer to home. Oh, I have embraced!! I’m just slow and it’s okay. And you’re right, I can run longer and I’m more confortable. I am trying to speed up, the more fit and trained I get, but I’m not ashamed of my slow turtle trot!! I am also a slow runner! There’s no shame in being a turtle, as long as we are running and having a great time doing it! Turtle over here too. I’ve been excited that I can maintain a 10:30 pace for my morning runs. It feels like a big victory. Umm, and I meant victory in that I feel super speedy — which is the opposite of your point. Hangs head in shame. Hello There. I discovered your weblog using msn. This is a very smartly written article. I’ll make sure to bookmark it and return to read extra of your helpful info. Thank you for the post. I’ll certainly comeback. education. Toddlers believe that they can attain their highestlevel of performance. or obvious through public threats, name-calling or intimidation. until spring this year that something just clicked.